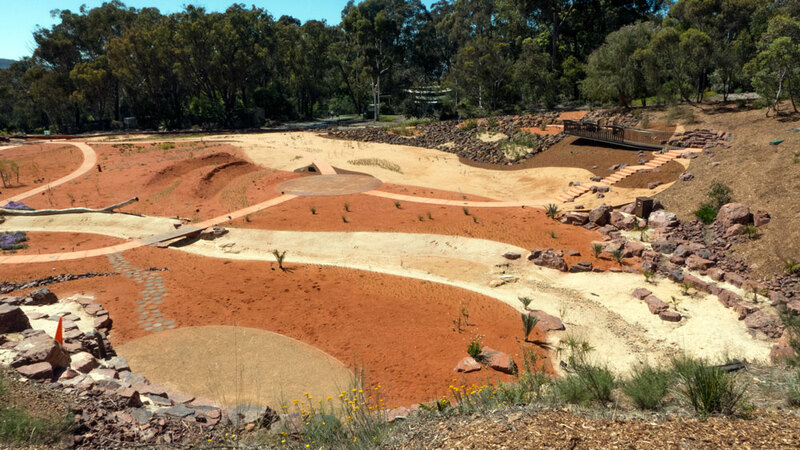 The Botanic Gardens’ own words: The vision behind the Red Centre Garden is to inspire appreciation for Australia’s unique desert plants and landscapes. 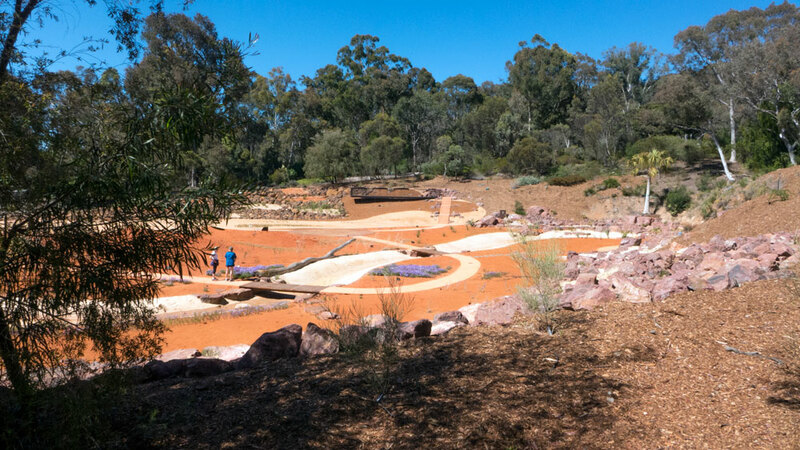 The garden inspires a ‘sense of place’ connecting people to some of the iconic plants and landscapes of central Australia through a memorable and educational experience. The story themes integrate elements of the ephemeral nature of this country, the indigenous connection to country and prominent plant species and plant communities. 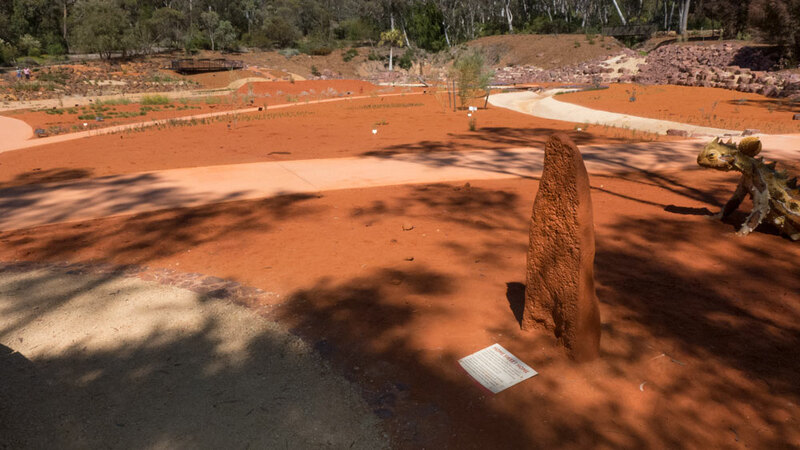 The design is visually stunning — simple yet dramatic — combining elements of the natural beauty of the red centre landscapes with aspects of contemporary landscape design. I suspect that this has been opened before it was ready, probably it needed to be opened before the end of the Canberra 100 celebrations. This is a shame as it is not in a state to be fully appreciated. There is a lot of work yet to be done. This is not a visually stunning design. Yet. It is definitely stunning in that it so different from the rest of the gardens. The design elements are reasonable and now await the work of horticulturists to introduce layers of design through new plantings as well as the growth of the few already in place. It will be interesting to see how the people of the Botanic Gardens do their magic with their plants. Something they do well. In this case there will be the added challenge of working on totally designed fabricated open space that it supposed to deliver a ‘sense of place’. There will indeed be a challenge given the uniqueness of the interior of Australia and that this particular ‘Red Centre” will always be in the Canberra climate and be surrounded by the dense bushlands and gardens. Despite any notes of criticism above, I think this initiative will deliver in time. Just that it does not yet. There is an obvious link to the Melbourne Botanic Garden’s new gardens in the south of Melbourne at Cranbourne. The Cranbourne site is very much a highly designed garden space. The site combines a high-profile use of hard-edged materials, pattern making as well as specialist plantings to provide notions of the red centre. Many of the spaces operate less as gardens and more as museum spaces. This creates a different user experience instead of that of wandering through the usual botanic gardens such as the one in Canberra. Here the experience is the aromas, the changing atmospheres, the birds, the other fauna as well as the amazing native plants, bushes and trees all seen usually under Canberra’s intense blue skies. Stage one of Cranbourne went down well with just about everybody. The marketing of this site was successful; and that’s an understatement. As for the recent stage two, I hear a few doubts about the over-use of signature spaces. Maybe it does not work as well. Here’s one such review. I am yet to visit stage two. I am not sure at this point whether the Red Centre in Canberra signals a change of direction for the National Botanical Gardens in Canberra to have more open museum garden spaces in amongst its regional bush-scapes. The gardens are a place to meander, to walk, to exercise while taking in the marvels of our native flora and fauna. It’s a gem. As I said earlier, this new Red Centre within the National Botanic Gardens will be the subject of future visits to see how they bring things together.